1. A pack of big t shirts are the real deal. I picked a pack of XL men's v neck ts at the beginning of this journey and they've served me well. Helps in the beginning when it just looks like you've been eating to much late night. Now they are starting to look a bit like that beloved 90s classic the Baby Doll Tshirt but that doesn't stop me from sleeping in them. 2. Reading is good but like dessert, should have been enjoyed in moderation. 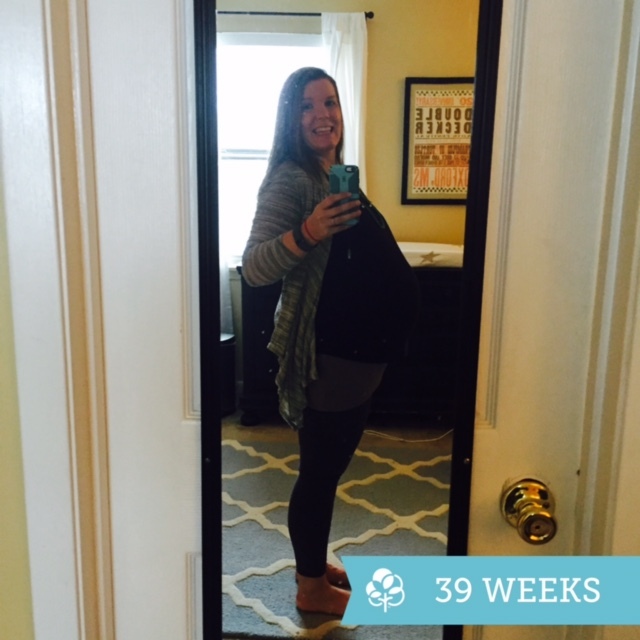 My two favorite pregnancy books were Mindful Birthing and Our Bodies, Ourselves . I absolutely overdid it with the "natural" birthing books; at this point they just mock me and my scheduled c-section from a shelf. However, knowledge, for me, lessens the anxiety and I enjoyed learning as much as I could about whatever I could. Mindful Birthing was a wonderful way to prepare for whatever comes, even if what comes isn't what you'd hoped for. 3. Rituals have made things more fun. 98% of Fridays during this pregnancy have started with a cafe au lait and some sort of treat from Bottle Tree Bakery. Also, I've read Peace Is Every Step out loud to the baby and enjoyed feeling his/her responsive wiggle. Hopeful for a mindful little weeble. And hoping that the little weeble isn't actually a giant turkey and cheddar croissant. That would be awkward. 4. Searching the hashtag on Instagram of however many weeks pregnant I am at the time hasn't helped me. At all. Even a little. 5. Pregnant Chicken is hilarious. 6. I became attached to how I wanted this pregnancy to wind up and never imagined how thrown I would be when it didn't work out like that. Breech baby = scheduled c-section around these parts and since I don't want to bring this baby into the world feet first in a birthing pool in my kitchen (What would Big Browne think?) looks like that's the direction we are taking. Of course, fingers still crossed for a last minute flip!! 7. Staying active has helped. I've slacked off a bit here towards the end but am proud of myself for walking and yoga-ing as much as I did. If you are pregnant and have access to a pre-natal yoga class, get yourself there immediately. Your hips and back will thank you. If you don't have access to prenatal classes then hit up your local gentle classes or join YogaGlo. 8. I've gotten depressed at times. And I've felt really guilty about it. And then I found acceptance. That was a proud moment. 9. It's amazing what people say to pregnant people. Here's my list of "favorites." 10. My tribe has been invaluable. Pregnant women, moms, ladies without kids, random kind people, my family, my husband, the big browne hound. Thanks be to God for all of them. 11. Nesting has been a blast. 12. Amazon Prime as been a(n) (expensive) blast. My recent order included a Bose wireless speaker, newborn socks, DoTerra Balance Essential oil and a pack of Always overnight extra heavy maxi pads. 14. I got my wedding ring stuck at one point and it was a wonderful lesson in the benefits of not procrastinating. 15. I've done what I've needed to do to help myself to feel better and I think that's a good thing to allow yourself to do. I slathered peppermint oil on my belly, played Paul Simon down at my crotch, flipped upside down (if you want to make someone anxious when you are 38 weeks pregnant, flip upside down without warning) all in attempts to flip this child. I've also not done any of that some days and instead walked waddled my happy self to TCBY for Waffle Cone Wednesday. Find your balance. Do you. That dresser causes an optical illusion with that baby belly. Trust me, it's huge.